Matthew Abram Groening is an American animator and a cartoonist who is best known for being the creator of popular cartoon series “Simpsons” which is the longest-running television series ever. Apart from being a renowned cartoonist, Matt is also a writer, producer and a voice artist. Notably, Matt is one of the wealthiest cartoonists ever, given his total assets that count in hundreds of millions. The American cartoonist, writer, producer, animator, and voice actor, Matthew Abraham ‘Matt’ Groening has earnings of $500 million. Born on February 15, 1954, in Portland, Oregon, USA. His father Homer Philip Groening was a filmmaker, an advertiser, a writer and a cartoonist, so it’s easy to see how Matt got the knack for writing cartoons. His mother was once a teacher. Matt graduated from Lincoln High School. He went on to attend the Evergreen State College where he started taking his interest in editing and writing as well as drawing cartoons more serious. While at college, he was the editor of the campus newspaper The Cooper Point Journal. He combined this with writing and drawing cartoons for the paper as well. At 23, Matt took the bold step of moving away from home to Los Angeles to become a writer. It was a big change for him but it did not quite go as he planned as he went from one “lousy job” to another most of which had absolutely nothing to do with writing. After the series of “lousy jobs”, Matt went into ghostwriting and other editorial jobs as he intended to be a writer but eventually, Matt started writing comic books, drawing the cartoons himself. First, Matt’s comic book entitled “Life in Hell” became an underground hit. It was loosely inspired by a chapter from Walter Kaufmann’s book “Critique of Religion and Philosophy”. At first, he distributed it in the book corner of Licorice Pizza, a record store in which he worked. The animated sitcom series, “Simpson” has been on air since 1989 and has become the longest-running sitcom of all time. Matt later created another set of characters for another series “Futurama” which he co-wrote with writer David X. Cohen. Matt started gaining fans and followers from “Simpsons”. This largely contributed to his assets. For his creations and contribution in his field, Matt has been inducted into the “Hollywood Hall of Fame”. He has also earned a “British Comedy Award for Outstanding Contribution to Comedy” among many other reputable awards. In January of 2016, it was announced that Groening was in talks with Netflix to develop a new animated series. After the talks were over, in July, Netflix made a two-season order for Disenchantment which equaled 20 episodes. In 2013, he co-authored Hard Listening (2013) with the Rock Bottom Remainders. This was published by Coliloquy, LLC. In May of 2010, he curated another edition of All Tomorrow’s Parties in Minehead, England. In 2003, Groening guest edited Da Capo Press’s Best Music Writing 2003 and curated a US All Tomorrow’s Parties music festival. He also worked on the illustration of Frank Zappa’s posthumous album. In 1995, he formed Zongo comics which was plenty like Bongo comics but targetted more mature readers. In 1994, he formed the Bongo comics with Steve Vance, Cindy Vance, and Bill Morrison. Bongo comics published comics which are based on The Simpsons and Futurama. 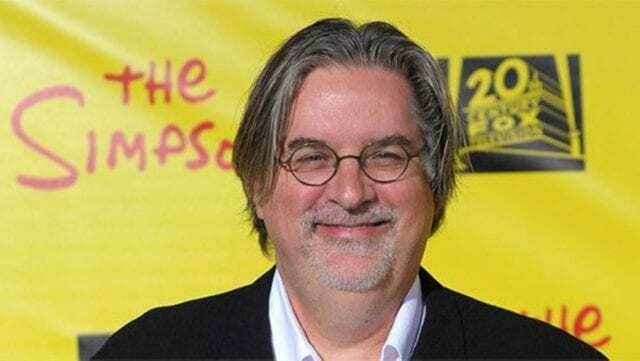 Matt Groening has been married twice in his life. He was married to his first wife, “Deborah Caplan” from 1986 to 1999. In 2011, he married Agustina Picasso and still together till date. He is also a father to three children. For now, Matt enjoys a celebrated life and lives off his fabulous net worth of $500 million.